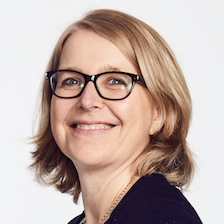 Anita Karlsson-Dion is Vice President in IBM’s Cognitive Process Services (CPS) unit, responsible for infusing cognitive and digital capabilities into our clients Finance & Administration, Procurement, Human Resources, and Financial Services organizations for IBM’s clients. Mrs. Karlsson-Dion joined IBM Finance in Stockholm, Sweden in 1988 after graduating from Stockholm School of Economics. She held management positions at the European Finance Headquarters in Paris, prior to moving to the US in 1999 for executive positions in Corporate Headquarters, Software and Hardware Groups (controller roles). In 2007 Anita joined IBM’s BPO business ($3B business) unit and was the VP of Finance until 2011 when she became VP Delivery and Solution for IBM’s Finance and Procurement clients. For the past three years she had overall responsibility for all Delivery across all clients in IBM’s BPO organization. Anita Karlsson-Dion was a member of the Swedish Sport Shooting National Team and finished 8th at the Olympic Games in Seoul, Korea in 1988.